Acadia National Park was created by the individual efforts of people who loved this place and were motivated to care for it. Today, you can be a part of this legacy by volunteering in the park with Friends of Acadia. Whether you volunteer for a few hours, a few months, or year after year, you’ll see a new side of Acadia, feel a deeper connection to the park, and leave this national treasure a little better than you found it. 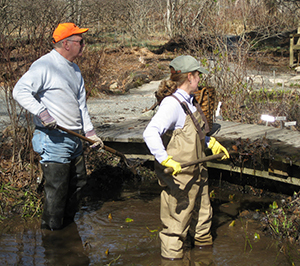 Many hundreds of volunteers contribute thousands of hours each year on essential projects. 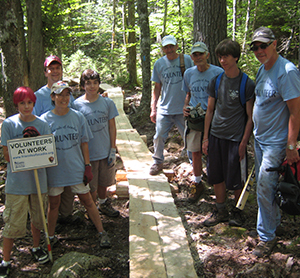 Together, they make a real and lasting difference for Acadia National Park. 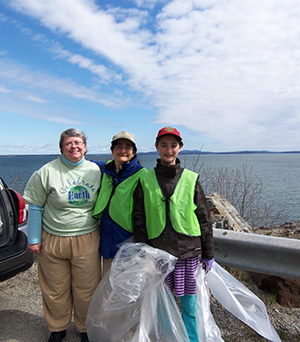 Take Pride in Acadia Day is the park’s most important annual volunteer event, marshaling the efforts of more than 400 volunteers to prepare Acadia’s historic carriage road system for winter. Friends of Acadia membership dollars pave the way for volunteer stewards to provide their best work. Each year we provide transportation, tools, training, and leadership on outdoor stewardship projects. If you would like to support the work of our volunteers, we invite you to make a donation and join Friends of Acadia. I am interested in volunteering with Friends of Acadia! Do you have any special skills or experience to offer?